Ravi Dixit created history today by becoming the first Indian male to win an Asian Squash title at the Asian Junior Individual Championship held at Colombo, Sri Lanka from 7-10 July 2010. Ravi Dixit, a product of the Indian Squash Academy, made history by becoming the first Indian to win the Under-19 boys’ title in the Asian junior squash championship (Individuals) in Colombo on Saturday. Dixit played and won what easily must have been the best match of his career. Down two games and staring at defeat with a match point down against the second seed Pakistan player Waqas Mehboob, the Indian fought back splendidly to defy all odds. Dipika got over a brief phase of uncertainty when her concentration lagged to put it across Malaysia’s Low Wee Nee in four games 11-8, 12-10, 10-12, 11-8. In the previous edition, Dipika had lost to Nee’s sister Wern in the final. 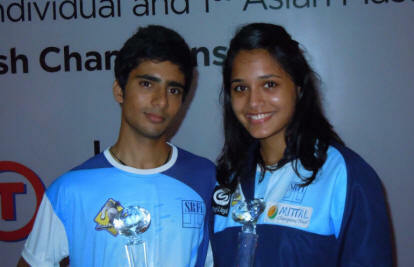 Dipika became the first player ever to win both the u15 & u19 Asian title. Indians put up a brave fight against the Malaysians. India lost the first singles when Harinder Pal Singh Sandhu lost to Mohd Nafizwan Adnan 10-12, 9-11, 11-13, but Ghosal came up with a brilliant performance to tame No ranked Modh Azlan Iskander 2-11, 11-8, 11-2, 11-4. With the teams tied, the pressure was on Siddharth Suchde who faced Malaysia No.2 Ong Ben Hee. The match lasted all of 75 minutes at the end of which Hee came through 11-6, 8-11, 14-12, 4-11, 11-2. Malaysia play Pakistan in the final, who beat Kuwait 2-0. Indian women entered the final of the team event of the Asian squash championship after an eight-year interval with a polished win against Korea in the semi-finals here Friday and will clash with Hong Kong who upstaged fancied Malaysia. The Indian women have every chance of annexing the title tomorrow as they had beaten Hong Kong in the league stage. India had last made the final in 2002, but lost. Young Anaka Alakamony set the ball rolling for the Indians when she beat Kim Ga Hye 11-8, 11-3, 11-8 in just 20 minutes. National champion Joshna Chinappa followed by taking the second singles with a 11-2, 11-4, 11-8 rout of Song Sun Mi in 22 minutes to clinch the issue. India booked a semi-final berth in the women’s team events by winning both their matches in the Asian squash championship. Joshna Chinappa, Dipika Pallikal and Anaka Alankamony, defeated Sri Lanka and Japan in Group B quite comfortably to advance to the semi-finals. Also progressing to the semis from Group B were Hong Kong who too won both their matches and face India to decide for the positions. Indian men’s team, comprising Saurav Ghosal, Harinderpal Singh Sandhu and Ritwik Bhattacharya, brushed aside Japan 3-0 in the men’s section and face China tomorrow.